Inability to acquire the players that add the most value to your team philosophy. If you can relate to any of these challenges, then read on! From a sports analytics expert perspective, let me explain to you why it’s a challenge for most coaches to acquire the right talent and get them to execute their strategy, and win championships. Sports data is increasing at a staggering pace. Teams are SCRAMBLING to discover how to maximize their analytic programs and increase player value. And significant growth in analytics has created new opportunities to improve coaching, improve player performance and leverage mobile devices to engage player response. It truly is an exciting time for sports and achieving peak performance! salary caps have skyrocketed and teams are sinking $100s of millions on players who are not adding commensurate value. teams do not have a process to effectively manage the growth of data and their advanced analytics programs. analytics are not being translated to the players responsible for delivering the results. and fans are demanding more synergistic team play that aligns with the play of championship teams like the Golden State Warrior, New England Patriots and Pittsburgh Penguins. What do great coaches like Mike Krzyzewski, Bill Belichick, Geno Auriemma and Nick Saban have in common? They know how to get players to buy into and execute their strategies. And they understand how to get the most value out of each one of their players. It’s no secret that the sports industry desperately needs a framework that enables teams to measure player value, translate complex metrics into player results and teaches players how to create value based on the coach’s strategy and team goals. Imagine how successful your team would be if the coach, analyst, players, assistant coaches and scouts had a proven process for reaching goals fast. What if you knew THE EXACT steps to help your players maximize value, execute your strategy and reach goals. I’ve helped organizations yield performance improvements of 300% and greater in as little as one month implementing these secrets. I’m here to tell you that you can have a championship caliber team… in much less time than you’ve ever imagined…regardless of your team’s talent and your past results. How would you like to be able to quantify your team’s performance at every level? Just imagine if your players were eager to execute your game plan and sacrifice personal goals for the team. The turnkey sports management system I’m about to share with you will change the way you coach forever. It evaluates your team’s performance strengths and identifies cost savings and ways players can add value to help the team win games immediately. I’ve taken the best practices and processes that have made my clients successful, and integrated them into a system ANY sports team can fully implement…in as little as 5 games! The first turnkey sports analytics and management solution that measures player value, builds player IQ and increases team synergy. It enables players to game plan according to the coach’s strategy and team objectives. The Agile Sports Analytics framework and application leverages performance management principals and systems development processes used by thousands of successful business teams, to build a winning sports team and dominate your competition. Many strategist have attempted, but NONE have succeeded…until now! 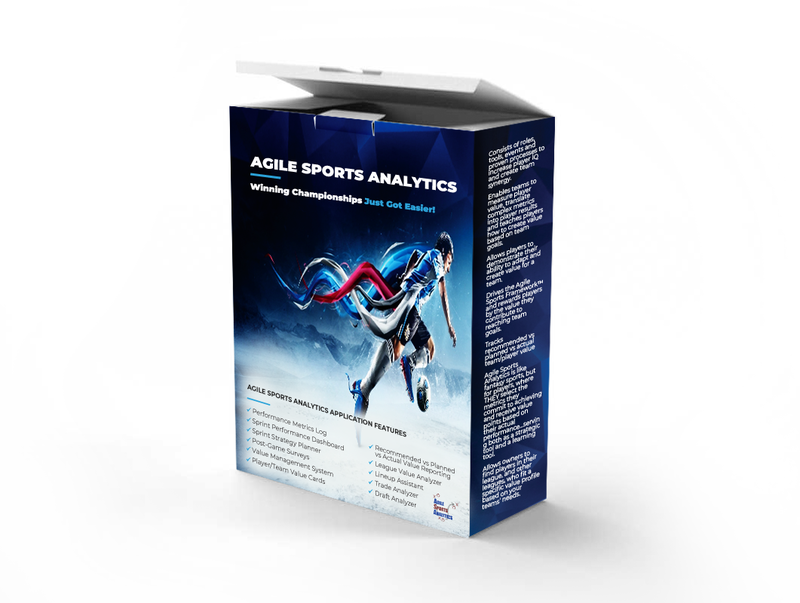 What makes Agile Sport Analytics superior to other stat tools on the market? Agile Sports Analytics is more than a stat tool. It’s a complete sports management system, with clear, purposeful roles for coaches, analysts, assistant coaches, scouts and GMs. It has defined events that are scheduled throughout each sprint to ensure that the team is continuously self-assessing and learning how to achieve synergy. Progress is measured in 5 or 10 game sprints where goals are achieved, inspected and adapted to address real time challenges the team is facing…making droughts and slumps a thing of the past! Players are evaluated and measured by how they contribute to the team strategy and their win contribution. Many sports analytics programs are designed to improve management and coaching decisions. The Agile Sports Framework and application does this as well, but also improves player decisions on the field and helps the team self-organize…a key element to creating team synergy and winning championships. What really sets Agile Sports Analytics apart from anything on the market is its unique approach that teaches athletes how to create value and execute the coach’s strategy. Through Player Value Cards and Team Value Cards the team analyst (or coach) can recommend a unique set of metrics that both challenge the players and also forces them to focus on the areas the team needs them the most… their high value metrics. And the PLAYERS get to select the metrics THEY commit to achieving…as long as they total the recommended value set by the analyst. IT’S LIKE FANTASY SPORTS, BUT FOR PLAYERS where they earn points based on the VALUE they deliver. Players have fun and learn how to create value. And coaches get their game plan executed. It’s a win/win situation. The team plays with synergy, which translates to VICTORIES! By applying the Agile Sports Framework, your team will achieve results by fostering continuous improvement through incremental inspections and adaptation. In simple English, this means your team is constantly improving, players are constantly discovering new ways to contribute to your game plan and create value for the team, and the team plays with synergy. What Data and Metrics Are You Tracking? There’s a saying, “what gets measured gets done”. If teams can successfully identify metrics that capture the intangible attributes that drive their success, and present it in a format where players can clearly understand and decide what they can do to create value, then a shift from the individual mentality to the team-first mentality will occur, and your team will achieve synergy. Synergy is the interaction and cooperation of the players to deliver a combined value greater than the sum of their separate value. Whether you are in the beginning stages of tracking your team’s data, or you are more advanced…like utilizing spatial data, neural networks, and advanced algorithms… Agile Sports Analytics presents analytics in a format which players translate into results on the court. Transforming Player Execution with the Agile Sports Analytics Application! 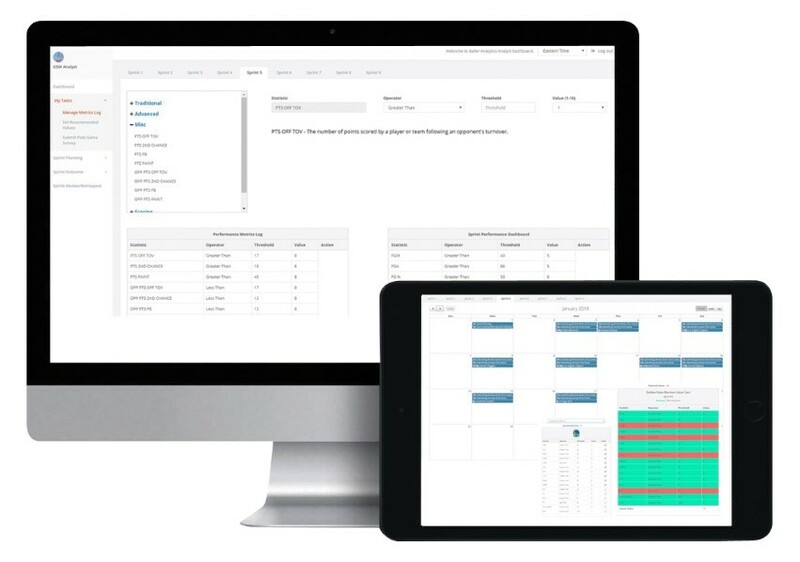 The Agile Sports Analytics Application is the first tool that drives the Agile Sports Framework™ processes, events and artifacts from start to finish. It allows coaches to devise a game plan, analysts to set recommended player values, and players to commit to their value metrics, serving both as a strategic tool and a learning tool. It helps owners and coaches identify players who best fit a specific value profile based on your team’s needs, making trades and draft picks more predictable. The Agile Sports Analytics Application is simple to use, with an easy to read dashboard that allows players, coaches, assistance coaches, analysts, scouts and team advisers to view and execute their responsibilities, such as defining metrics, assigning metric value, setting recommended and planned values, submitting post game surveys, the Sprint Strategy, scouting reports, post-game meeting notes, viewing the Sprint Outcome and Sprint Plan, and more. Discover the secrets and techniques that thousands of high performing teams know, but NO ONE has packaged for sports…until now. No more blindly selecting players based on stats that inflate player egos, but don’t result in wins. Players discover how to create value and demonstrate their ability to adapt their game to make team better. Gain higher Sports IQ. Analysts can apply analytics via an organization wide process that supports it. Can import their existing analytic programs into Agile Sports Framework, leveraging tools and stats already in place. Team goals are fully transparent, drive player goals and are guided by organizational objectives. Reach goals faster. I came to the realization that practically ALL teams need a turn-key, simple and effective sports management system to make sense of their data and walk them through the entire process, from player acquisition, to metrics creation, to value analysis, to player execution…and eliminate major coaching challenges once and for all! Simply buying tools and acquiring expensive players does not give coaches and owners the insight and tools they need to drive decision-making and translate metrics into results on the field, court or ice. The secret formula that winning coaches know that 90% don’t are delivered in the Agile Sports Framework and Agile Sports Analytics Application. Learn the reasons why coaches fail and make sure you never make these mistakes…again! As you can see, I’ve held nothing back. It’s all here…all of my years of researching and applying the very best techniques that will make your team soar to the next level… GUARANTEED! THERE IS NO OTHER SOLUTION LIKE THIS! You don’t have six months…one year…or longer to turn your organization around! These are competitive times. The turnover rate for coaches, and the demand to win is at an all-time high. To continue to improve and increase value on the court, field or ice you need a competitive edge. This Has To Be Expensive! You’re probably worried that this amazing system will be expensive. After all, the system and tools you are about to receive is guaranteed to deliver wins if you take action. So it’s reasonable to expect a large, initial investment, right? Wrong. Acquiring and applying the Agile Sports Frameworks is 100% free. No cost to you. I just want everyone to know about these powerful processes that have given my client’s success for the last 15 years. The Agile Sports Framework and Application is powered by a workflow process that is so efficient that players increase their value almost immediately. And if you believe Agile Sports Analytics can change improve your team’s play…like I 100% ABSOLUTELY KNOW IT WILL, then you can bring me on board to help your team implement it. You won’t find a complete sports management solution like this…ANYWHERE. Act Now! Think of what could be of your upcoming season if you had a system that rewarded players for executing your strategy and creating value. Now, think about what will happen if you don’t act on this opportunity. To learn how I can help your team transition to an Agile Sports organization, email me at victor at agilesportsanalytics dot com or call me at 1-888-861-8733. P.S. Please don’t put this off! If you’re serious about improving team performance and winning games THIS YEAR, then contact me now! Pingback: Sports Analytics Methods - Statistical Mean or Average?